by Robert D. Richardson, University of Iowa Press, 2009, 112 pages. I've just read the first three chapters, and I found it really insightful. For example, why are we reading? 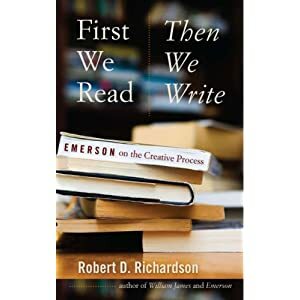 In the first chapter (Reading), Richardson says "Emerson did not read in order to pick up the common coin of his culture or class, ....Emerson read for personal gain, for person use." He also says that "Emerson himself read almost entirely in order to feed his writing." Indeed, we should read actively, with some useful objectives, not for showing off, not for chitchatting. It's a plain and simple idea, but I just didn't think of it. Now I get it, "read was just the means, the end -- the purpose -- was writing." The other questions I always concerned about reading are how much should we take from a book, and when should I stop reading. Emerson used newspapers as an example, "Do not read when the mind is creative. And do not read thoroughly, column by column. Remember they are made for everybody, and don't try to get what isn't for you." He also said (to his friend Woodbury) that "Do not attempt to be a great reader....Remember you must know only the excellent of all that has been presented. But often a chapter is enough." Hmm....I think I really need to remember this: just get what I need, do not try to read them all.